Earth Day was first observed in the U.S. in 1970, and now observed in 192 countries worldwide. While it is good to recall history and how the Earth Day has all started, it’s also important that we think about the environmental movements that are being carried out lately. Let’s talk about electricity. Electricity generated by modern society is soley dependent on oil and coal, both of which add to greenhouse gas buildup in the envieronment. While it is a known fact that fossil fuel supplies are limited, our homes and cars still require lots of energy. Solar energy is ample throughout many parts of America. The amount of sunlight hitting the U.S. every single day is more than 2,500 times the entire country’s daily energy usage. 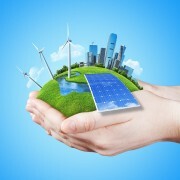 There are different kinds of technologies used to create electricity from solar power. To be able to create solar power, many homes and establishments install photovoltaic panels, which absorb sunlight. They may also use semiconductors to create usable energy. Larger structures use panels, but others use lenses or mirrors focused to a small area to deploy concentrated solar panel, thus creating electricity from tremendous heat. Both technologies help the Earth because they reduce the need to burn fossil fuels. The wonderful thing about solar energy is that it produces its greatest output as demand spikes. During hot summer days, energy usage rises due to air conditioners, but that same exact sunlight that warms the country can be stored and used to power those devices. So, how can you acquire energy and still help protect Mother Earth? Go solar! A new report says that two Texas cities are among the the leading cities in solar power nationwide. According to a report released on Thursday by the advocacy group Environment Texas, San Antonio ranks sixth among U.S. cities in installed solar capacity. Austin, on the other hand, ranks 16th. The report stated that San Antonio utilities and residents had installed 84 megawatts of solar capacity through 2013, while Austin had installed 12 megawatts. Nationally, one megawatt of solar power can supply an average of 164 homes. Because improved technology has driven down prices, the U.S. has more than 200 times as much solar power capacity installed today as it did in 2002, according to the report. Los Angeles, San Diego, Phoenix, San Jose and Honolulu were the top five U.S. cities for solar panel installations, report says. Texas leads the nation by far in solar energy potential with its long-stretching boundaries and great supply of solar radiation. According to the State Energy Conservation Office, much of that capacity is in West Texas, where the sun supplies 75% more direct solar radiation than East Texas. According to advocates, since Texas officials have not implemented the same mix of incentives for solar power seen elsewhere, solar energy makes up a tiny fraction of Texas’ energy use. According to the National Renewable Energy Laboratory, compared to other states, Texas ranks just sixth in installed capacity, thus making it hard for the industry to gain an edge statewide. The brightest spots for solar energy in the state are San Antonio and Austin. By setting renewable energy goals and offering financial incentives for solar installations, the cities and municipally owned utilities continue to grow. With at least 100 megawatts of energy derived from renewable resources other than the wind, San Antonio’s CPS Energy, for instance, has set a goal of using renewable energy to meet 20% of its electricity demand by the year 2020. Including 200 megawatts from solar power, Austin executed a renewable energy standard in 2011 that requires its utility, Austin Energy, to get 35% of its energy from renewable sources by 2020. Texas cities powered by competitive utilities inside the state’s deregulated energy market fell lower in the solar rankings. With a solar capacity of four megawatts, Houston ranked 32nd; Dallas, on the otherhand, ranked 44th with one megawatt. In recent sessions, the Texas Legislature had taken some steps to boost solar power statewide. A bill that was passed in 2011 (House Bill 362) prevents homeowners associations from interfering with the installation of solar panels. Property Accessed Clean Energy, a program that enables cities to enroll in to help commercial property owners finance clean energy projects, was a program approved by the Legislature in 2013.